The boab tree has always fascinated me. This strange, bottle-shaped tree has such an unusual form and each one is unique. Australian boabs are found only in the Kimberley region of north-west Western Australia, although some specimens can be seen in other places where they have been planted. Traditionally, boabs were used by Australia’s indigenous people for shelter, food and medicine. 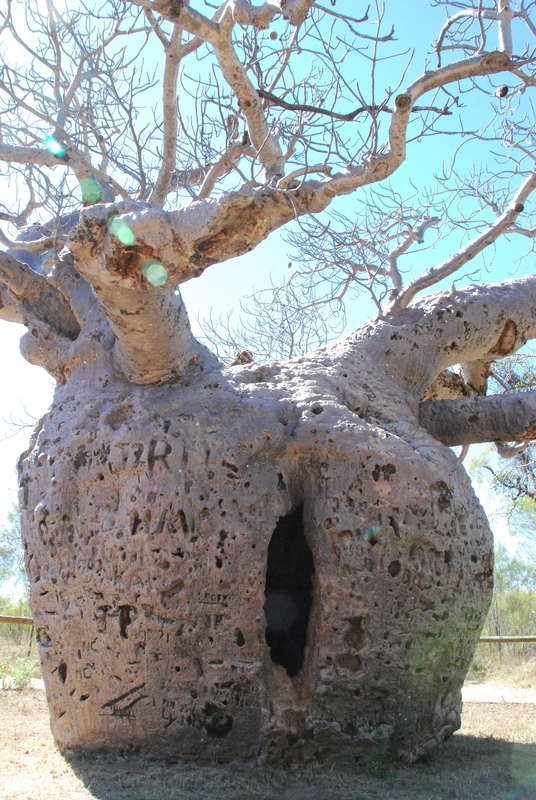 A couple of extremely large specimens were also used as “prison trees” in the late 1800s and I was lucky enough to see one of those last year on a day tour from Broome with Kimberley Wild Expeditions. Our tour stopped for a while at the Derby Prison Tree, at a remote spot known as Myalls Bore, about 7km from the town of Derby. The hollow tree – which measures almost 15 metres around its trunk and is believed to be more than 1500 years old – was a resting point for police travelling with Aboriginal prisoners to Derby from places such as Fitzroy Crossing and Christmas Creek, and sometimes further afield. By 1887, there was a gaol at Derby but the police party often stopped overnight at the giant boab, after walking between 25 and 50km a day, with the prisoners in chains (mostly for crimes such as killing and eating cattle). The hollow tree trunk has a “door” a metre wide and two metres high. The tree also has traditional cultural significance to Aboriginal people and in 1972 the site was protected under the Aboriginal Heritage Act. A fence was built around it to prevent people compacting the soil around its roots and causing damage to it. In some ways, it was too late; the tree is scarred by carved initials all over it. Known as Larrkardiy in the local indigenous dialect, boabs are believed by the indigenous people to have special mystical forces – and those who intrude or injure the trees are thought to be exposing themselves to retribution by these magic forces. 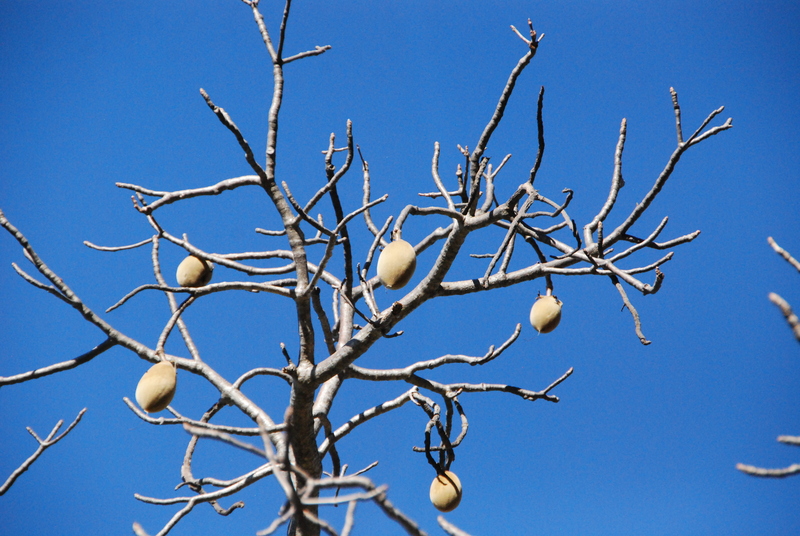 The fruit of the boab is a source of vitamin C. Indigenous people used to eat the gel of the ripening fruit mixed with native bees’ honey. The Australian boab tree (Adansonia gregorii) is related to the Madagascan and African Adansonia species known as baobabs. Boabs grow all around the town of Broome, the heart of the Kimberley region. 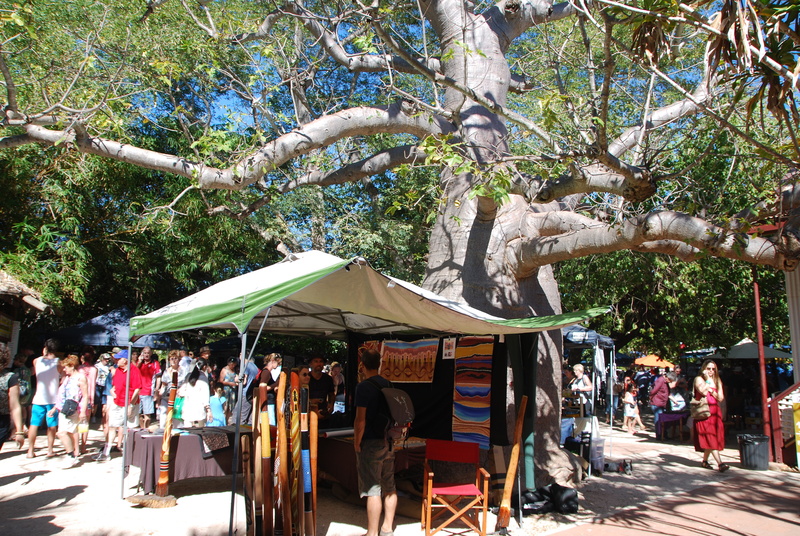 The weekend Broome Courthouse Markets, are held in the shade of many fine boabs in the gardens of the historic Broome Courthouse. A Glass Half Full travelled as a guest of Australia’s North West and Kimberley Wild Expeditions. I’m a big fan of the Boab. On a Variety Club Bash, I slept under one for several nights. I felt rejuvenated. Go the Boab. Great little yarn. Sleeping under one sounds much better than sleeping inside one! I reckon snakes would like those hollow trunks, don’t you? No, A Glass Half Full, snakes are not keen on the boab. They are too exposed. But ants, lizards and some birds love boab trees. I’m glad you thought so. They’re not the most attractive trees in the world, but that’s part of their strange appeal, I think! The Boab is the most beautiful tree in Australia. I’m not sure I agree with that, Tommy – but it has its own kind of strange beauty. I love these trees, but have only seen a few, mostly replanted in botanic gardens. I wonder how the Aboriginal prisoners felt being imprisoned in them given their beliefs? Another unfortunate case of not understanding Aboriginal spiritual and cultural lore. I’ve just finished re-reading Kate Grenvilles’ Searching for the Secret River’, which highlights early settlement ‘misunderstandings’ brought about by a lack of knowledge of Aboriginal beliefs and philosophy. Such a great book on her research for writing ‘The Secret River’. Thanks Briar. I agree, it must have been a terrible thing for the indigenous people, in many ways. I loved The Secret River too, so must get around to reading the back story, which is always so interesting. You’ll love the back story Lee. I found it fascinating. I keep re-reading it every few years. Just finished it and going straight into the novel again, while it is still fresh. Those trees are so unusual. I love them! I love trees anyway and always wished I could live in one. I spent a lot of childhood summer days up in the trees. If I’d had a tree like this in my yard, I probably would have tried to live inside it. I can relate to that. My childhood home also had lots of trees and I had my favourite for climbing up and just sitting in – for hours. I hope there are still children doing that these days…perfect spots for dreaming and imagining.